Above the crown of your head is a lotus. 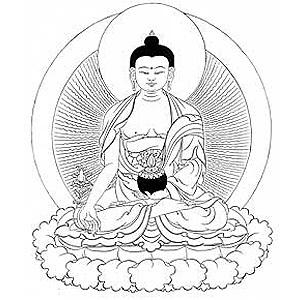 In its center is a white moon disc and seated upon that is your root guru—the dharmakaya essence of all the Buddhas—in the form of the Medicine Buddha. He is blue and his body radiates blue light. His right hand, in the mudra of granting sublime realizations, rests on his right knee and holds a stem of the aurora plant between his thumb and index finger. His left hand, in the mudra of concentration, holds a lapis lazuli bowl filled with nectar. Seated in the vajra position, he wears the three saffron robes of a monastic. He has all the signs and marks of a Buddha. How wonderful it would be if all sentient beings were to abide in equanimity, free of bias, attachment, and anger. May they abide in this way. I shall cause them to abide in this way. Guru Medicine Buddha, please inspire me to be able to do so. How wonderful it would be if all sentient beings had happiness and its causes. May they have these. I shall cause them to have these. Guru Medicine Buddha, please inspire me to be able to do so. How wonderful it would be if all sentient beings were free from suffering and its causes. May they be free. I shall cause them to be free. Guru Medicine Buddha, please inspire me to be able to do so. How wonderful it would be if all sentient beings were never parted from upper rebirth and liberation’s excellent bliss. May they never be parted. I shall cause them never to be parted. Guru Medicine Buddha, please inspire me to be able to do so. Especially for the sake of all mother sentient beings, I must quickly and more quickly—in this very life—attain the precious state of complete and perfect buddhahood. Therefore I shall practice the yoga method of Guru Medicine Buddha. And present clouds of every type of offering, actual and mentally transformed. And rejoice in the virtues of all holy and ordinary beings. I dedicate all the virtues of myself and others to the ripening of the two bodhicittas and the attainment of buddhahood for the benefit of all sentient beings. Imagined as a Buddha land and offered to you. May all beings enjoy this pure land. The objects of attachment, aversion, and ignorance—friends, enemies and strangers, my body, wealth and enjoyments—I offer these without any sense of loss. Please accept them with pleasure, and inspire me and others to be free from the three poisonous attitudes. idam guru ratna mandala kam nirya tayami. I request you, Bhagawan Medicine Guru, whose sky-colored holy body of lapis lazuli signifies omniscient wisdom and compassion as vast as limitless space, please inspire my mind. I request you, compassionate Medicine Guru, who holds in your right hand the king of medicines symbolizing your vow to help the pitiful sentient plagued by the 404 diseases, please inspire my mind. I request you, compassionate Medicine Guru, who holds in your left hand a bowl of nectar symbolizing your vow to give the glorious undying nectar of the Dharma which eliminates the degenerations of sickness, aging, and death, please inspire my mind. On the crown of Guru Medicine Buddha is a wish-granting jewel, which in essence is your guru. Above that, on a lotus and moon disc, is the Buddha King of Clear Knowing, red, his right hand in the mudra of bestowing sublime realizations and his left hand in the mudra of concentration. Above him, on a lotus and moon disc, is the Buddha Melodious Ocean of Renowned Dharma, yellow, with hands in the same mudras. Above him, on a lotus and moon disc, is the Buddha, the Supreme Glory Free from Sorrow, pink, with both hands in the mudra of concentration. Above him, on a lotus and moon disc, is the Buddha, the Stainless Excellent Gold, pale yellow, right hand in the mudra of expounding the Dharma and left hand in the mudra of concentration. Above him, on a lotus and moon disc, is the Buddha King of Melodious Sound), red-yellow, with hands in the same mudras. Above him, on a lotus and moon disc, is the Buddha Renowned Glorious King of Excellent Signs, yellow, with hands in the same mudras. With your hands together in prostration, recite three or seven times each verse with the name of each Medicine Buddha and from your heart take refuge in that Buddha. If you are doing this practice for someone who is dying or has died, aspire that he or she is born in a pure land or an upper realm. To the Bhagavan, completely perfected Buddha having realized the ultimate nature of all phenomena, Buddha Renowned Glorious King of Excellent Signs, I prostrate, go for refuge, and make offerings. May your vow to benefit all sentient beings now ripen for myself and others. To the Bhagavan, completely perfected Buddha having realized the ultimate nature of all phenomena, Buddha King of Melodious Sound, Brilliant Radiance of Skill Adorned with Jewels, Moon, and Lotus, I prostrate, go for refuge, and make offerings. May your vow to benefit all sentient beings now ripen for myself and others. To the Bhagavan, completely perfected Buddha having realized the ultimate nature of all phenomena, Buddha Stainless Excellent Gold, Great Jewel Who Accomplishes All Vows, I prostrate, go for refuge, and make offerings. May your vow to benefit all sentient beings now ripen for myself and others. To the Bhagavan, completely perfected Buddha having realized the ultimate nature of all phenomena, Buddha Supreme Glory Free from Sorrow, I prostrate, go for refuge, and make offerings. May your vow to benefit all sentient beings now ripen for myself and others. To the Bhagavan, completely perfected Buddha having realized the ultimate nature of all phenomena, Buddha Melodious Ocean of Renowned Dharma, I prostrate, go for refuge, and make offerings. May your vow to benefit all sentient beings now ripen for myself and others. To the Bhagavan, completely perfected Buddha having realized the ultimate nature of all phenomena, Buddha Delightful King of Clear Knowing, Supreme Wisdom Ocean of Dharma, I prostrate, go for refuge, and make offerings. May your vow to benefit all sentient beings now ripen for myself and others. To the Bhagavan, completely perfected Buddha having realized the ultimate nature of all phenomena, Medicine Buddha King of Lapis Light, I prostrate, go for refuge, and make offerings. May your vow to benefit all sentient beings now ripen for myself and others. Then continue with one of the visualizations below. In response to your request, infinite white rays of light stream down from the heart and body of Guru Medicine Buddha. Completely filling your body, they purify all disease, spirit harm, and the negative karma and mental afflictions that cause these. Your body becomes the nature of light, clean and clear like crystal. The light pours into you a second and third time filling your body with great bliss. The light beams then radiate out in all directions to heal the sicknesses and afflictions of all mother sentient beings. Recite the mantra while doing these visualizations. At the conclusion of the mantra recitation, the Medicine Buddha melts into light and absorbs between your eyebrows, blessing your body, speech, and mind. Then dedicate the merit. (Tayata) om bhekandze bhekandze maha bhekandze randza samungate soha. may I complete the ocean-like deeds of the bodhisattvas. who have been infinitely kind to me. infinite as space, may I also become a compassionate guide of all sentient beings existing in all directions of the universe. may anyone who merely sees, hears, remembers, touches, or talks to me be freed in that very instant from all sufferings and abide in happiness forever. Sadhana written by Ngulchu Dharmabhadra and translated by Kyabje Zopa Rinpoche. Medicine Buddha featured image ©http://wellcomeimages.org. Sanskrit spelling of the mantra (above is Tibetan pronunciation of Sanskrit): Om namo bhagavate bhaisajyaguru vaidurya prabha rajaya tathagataya arthate samyaksam buddhaya tadyatha om bhaisajye bhaisajye maha bhaisajye raja samudgate svaha. Translation: I honor the Buddha Master of Healing, the King of Lapis Lazuli Light, Tathagata, Arhat, Perfectly Enlightened Buddha, saying: To the healing, to the healing, to the supreme healing, hail!